Sleep disorders are an incredibly common problem around the world, with 40-60 million people in the United States alone suffering from some sort of chronic or short-term sleep disorder. Sleep problems like insomnia or chronic drowsiness can come on as a result of depression, anxiety, a stressful lifestyle, or as a symptom of a larger illness that causes excessive strain on the body. In many cases it can be a challenge to pinpoint the exact cause of someone’s sleep problems, which can make it difficult to properly diagnose and properly treat with medication. Even if a sleep disorder is treatable with medication, many people dislike the side effects.Ambien is a great example of this. For this reason, natural remedies like CBD oil are becoming a popular option for people desperate for a good night of sleep without worrying they will sleep walk or drive and wake up in the hospital. There are many ways that CBD is reported to help the body, from pain and inflammation relief to help with depression and anxiety and, as a result, helping you get a better night of sleep. While the research on CBD oil and its many effects on the body is still in its early stages, what we do know so far is promising in terms of wellness from a preventive and natural standpoint. When CBD oil is ingested, it is absorbed both sublingually through the delicate vessels of the mouth, and through the stomach and gastrointestinal tract. Unlike its partner-in-crime THC, CBD has no psychoactive effects so it will not get you high. Instead, CBD acts on different receptors in the endocannabinoid system that help with calming pain and inflammation throughout the body, relieving stress and anxiety, and thus helping you relax and drift off into a restful night of sleep. CBD acts as a modulator on CB2 receptors, which are often weakened or depleted as a result of many kinds of human diseases and conditions. Boosting the effects of these receptors is helpful in mitigating the painful or stressful symptoms of disease that can affect your quality of life. This study found potential in CBD as a wake-inducing agent and viable management for several health conditions , particularly psychiatric and neurodegenerative disorders that can affect sleep quality. If you suffer from other conditions that make falling or staying asleep a struggle, CBD may help you achieve a fuller sense of calm and stability that takes away the distractions of other symptoms and lets you fall asleep with ease. Finding a quality CBD oil for sleep can be a challenge in an unregulated market that has no FDA or regulation requirements. Unfortunately it’s easy for money-hungry entrepreneurs to cut corners and market their oils as pure and organic when they’re really made with plants sprayed with pesticides or have not been lab-tested for potency and purity. 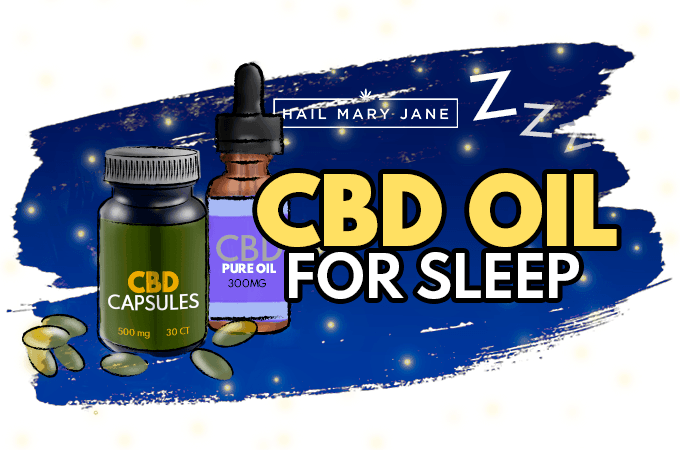 Through our research and experience in the cannabis industry, we recommend and trust these brands if you’re looking for a quality CBD oil for sleep and insomnia.